Where Were You During the Original iPhone Keynote? 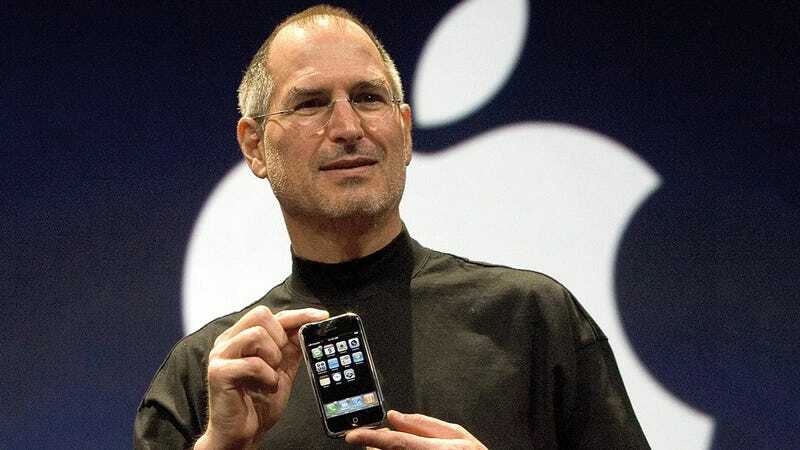 Ten years ago today, Apple held a flashy press conference and revealed the details of one of the most hotly anticipated gadgets of all time: the iPhone. The event was held at Macworld (RIP), an annual Mac/Apple conference that went head-to-head with CES. From what I understand, plenty of members of the tech press had to decide whether to watch the unveiling of the Jesus Phone or to sit around and watch whatever was announced at CES that year. Like millions of others, I watched the keynote at home, over a QuickTime stream in iTunes. It was a Tuesday, and technically the first day of classes. But rather than attending my first class on film noir or Accounting 402, I skipped class to watch the iPhone launch (sorry, Mom). I still remember watching that keynote, enraptured for nearly two hours. It seems strange to remember now, but the first 30 minutes were actually spent discussing new iTunes ads and on the original Apple TV. Sitting on my couch, I remember getting antsy—come on already! Get on with the show! And then at the 27-minute mark, Steve Jobs paced around the stage for the iPhone. From the second that iPhone came onto the screen, I had full-on gadget lust. I remember looking at my beloved Motorola Razr in disgust and trying to figure out how I would ever afford the iPhone’s $500 price tag, especially as I was still stuck in a two year contract with T-Mobile, and the phone was only going to run on Cingular (now known as AT&T). Even the product deficits—it didn’t support 3G or MMS messaging—didn’t seem to matter. I wanted this phone, perhaps more than I had every wanted anything. Unfortunately for me, the reality of being an unemployed college student meant I wouldn’t buy my own iPhone until some time in 2008, and I had to settle for the iPod Touch in the meantime. Paired with my Razr it was almost like having an iPhone. Almost. Watching that keynote now, it’s amazing to consider how much this changed not just mobile phones, but the way gadgets were unveiled. We’d seen big gadget releases before, but nothing like this. Apple has the whole keynote on its website, and you can watch it in iTunes as a podcast. Or just watch this YouTube video below to relive the keynote memories. Where were you when the iPhone was announced? Did you love it at first site or were you still clinging to your BlackBerry or Palm Treo. Let’s relive our memories in the comments.